"Adversity does not build character, It reveals it." For the 3rd time in 10 years, Cathay Pacific has been named World's Best Airline, winning the 2009 Airline of the Year title in the latest World Airline Awards - Cathay Pacific being a previous winner of this prestige global title in 2003 and 2005. Edward Plaisted (CEO of Skytrax) said ... " the Cathay Pacific victory this year is the third occasion in the last ten years they have won this prestige title. A factor behind the Cathay Pacific win is clearly the consistency of product and service that they provide to their customers. Not only are Cathay Pacific satisfying their passengers onboard flights, but the ratings they achieved for their airport operations in Hong Kong also played a considerable part in this success. At a time of considerable difficulty across world economies and of course the airline industry itself, it is nice to have some truly good news to spread in announcing the 2009 World Airline Airline Awards. 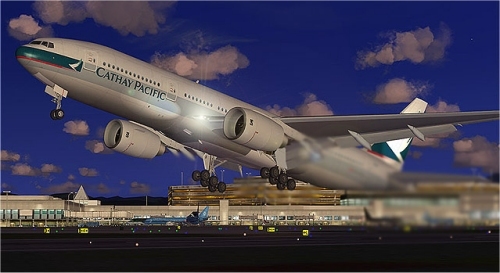 We extend our congratulations to Cathay Pacific Airways on their crowning as 2009 Airline of the Year. These Awards represent the voice and opinions of the travelling public, and bears great testimony to the quality of service being delivered in the front-line". It's our 20th Anniversary serving the US and we would like you to celebrate with us! Visit our 20th Anniversary page and take a journey through some memorable Cathay Pacific milestones. From glamours Nina Ricci uniforms to the world's first trans-polar flight, relive the early days of flying nonstop to Hong Kong on our 20th anniversary page. 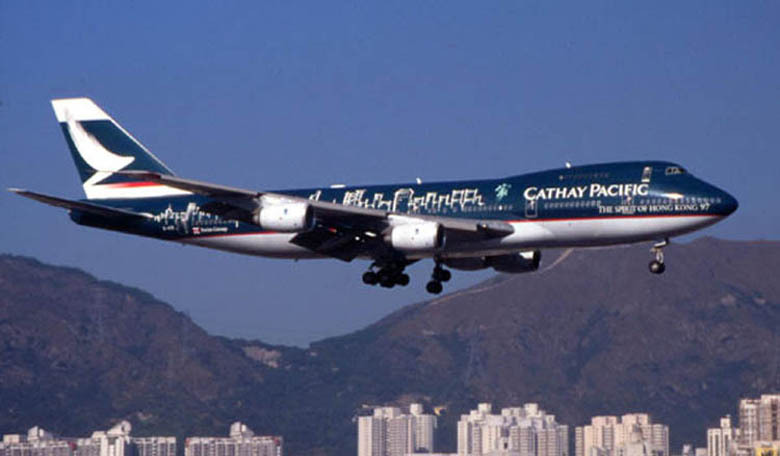 CATHAY PACIFIC is headquartered in Hong Kong, Cathay Pacific Airways is one of the world's leading passenger and Cargo airlines, serving more than one million passengers a month to Asia, Europe and North America. 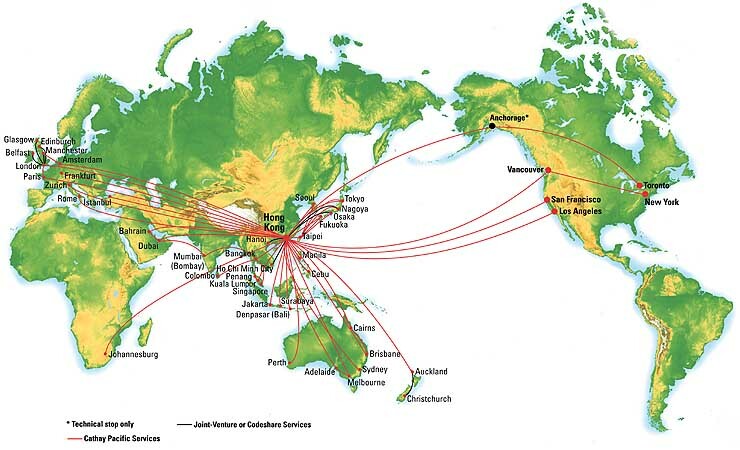 The carrier offers daily nonstop service to Hong Kong and beyond from Los Angeles, San Francisco, New York, Toronto and Vancouver; daily nonstop service between New York and Vancouver; and dedicated cargo service to Hong Kong from Atlanta, Chicago, Dallas, Los Angeles, San Francisco, New York, Toronto and Vancouver. In September 2006, Cathay Pacific made aviation history by integrating with Dragonair and enhancing its cooperation agreement with Air China to provide an unparalleled China and Asia network. The airline is a member of the oneworld™ alliance and a partner in Asia Miles, a leading Travel Reward program. one of the youngest and most efficient fleets of any major airline. The fleet of close to 60 operational aircraft has an average age of just over 4.7 years, and features some of the most technologically advanced aircraft from the world's leading aircraft manufacturers Boeing and Airbus Industries. CATHAY PACIFIC Like most major airlines, Cathay Pacific maintains a range of different aircraft with different capacities and ranges to give it flexibility and serve the different routes in its network. The airline's routes are divided into regional routes around Asia, and long-haul routes to places such as Europe, North America, South Africa and Australia. Many long-haul flights arrive in Hong Kong in the morning and leave in the evening. When in Hong Kong during the day, the long haul B747s and A340s also serve on regional routes. "The Spirit of Hong Kong"
Click on the World Map for Special Fares from CATHAY PACIFIC for Horizon Resources Clients and Guest! SAN FRANCISCO - February 28, 2006 - Cathay Pacific Airways, the Hong Kong-based international luxury airline, kicked off its 60th anniversary celebrations this year by being named 'Airline of the Year 2006' by Air Transport World (ATW) magazine. ATW is the leading monthly magazine covering the global aviation industry. Its annual industry awards were created in 1974 to recognize excellence and have become one of the most prestigious honors in the airline industry. According to ATW, Cathay Pacific "is respected and admired among peers for its unwavering commitment to safety, technical excellence and customer service." 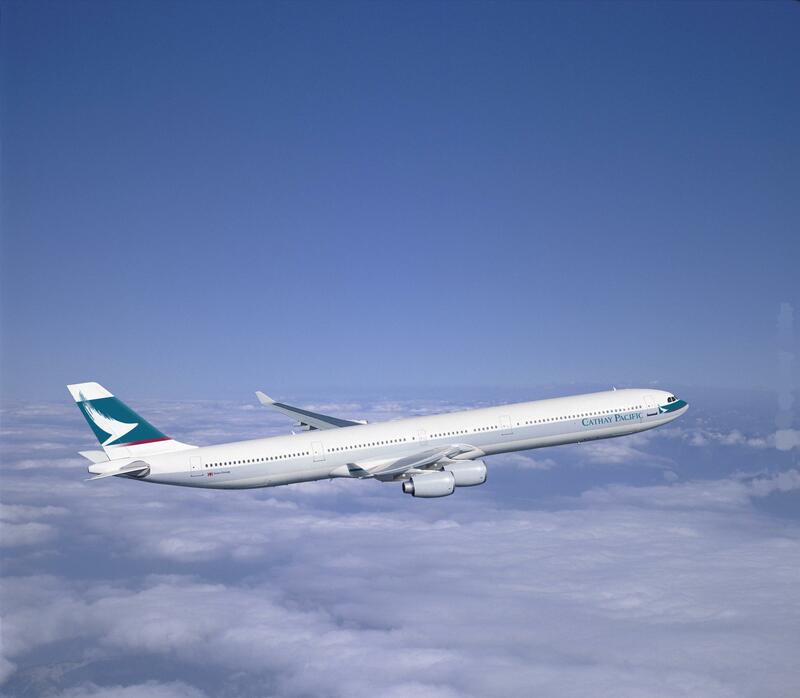 For 60 years, Cathay Pacific has had the privilege of being Hong Kong's home carrier. From their humble beginnings in 1946 with a single aeroplane we called Betsy, they have grown to become Airline of the Year with nearly 100 aircraft connecting our home to over 90 destinations around the world. "A darn good airline man"
In Memoriam Peter Sutch, 1945-2002, Former Chairman, Cathay Pacific. We are proud to have been selected as an affiliate of Cathay Pacific. Only Cathay Pacific and IMG International Insurance is displayed on this page.